Engineering has really no age bar. In fact the Quality services always exhibit a long life. Famous Singer and winner of Bharat Ratna ward, Smt. Lata Mangeshkar, once said, “Practice of Correct Sur in music leads to increase in the life of a singer”. This statement can be extended to engineering also. The practice of correct engineering principles lead to increase in the life of an Engineer. If fact such engineer no more remain an engineer, but becomes a visionary icon personality. Probably this has come true for Sir. M.V., Prof. Timoshenko and many more who have seen 100+ years of their lives. Author of numerous books, and Technical Papers, Prof. P.C. Varghese, an imminent professor of Structural Engineering, has once again proved the above statement. Prof. Varghese recently completed 90 years of his age and more than 60 years of service to the Civil / Structural engineering. On this occasion, he was felicitated by IIT-Madras (Chennai) on 26th March’2011; incidentally it was a 40th Anniversary of ‘Structural Engineering Laboratory @ IIT Madras’. In this document a brief about this Gem are covered. Shri Puthenveetil Chandapillai Varghese was born on 3rd Mach’1921 at Mavelikara, Kerala. He did his primary schooling at Mavelikara itself. In 1939 he completed his Pre-Degree education at CMS College, Kottayam. Later he moved for his B.Sc. Degree (with key subjects as Mathematics, Physics and Chemistry) at Loyola College, Madras. He completed the same in Yr. 1941. The consistent urge for the knowledge made him to join B.Sc. Degree (Civil Engineering) at College of Engineering, Trivandrum, which he completed in 1945. In Year 1947 Dr. Varghese, joined Building Research Station, Roorkee, as a Scientist. He received the Scholarship from Ministry of Irrigation and Power, Government of India, to study Soil Mechanics and Earth Dams. Soon, in Yr. 1948, he left for MS Degree (Civil Engineering) at Harvard University, USA. He completed the same with a great success, and then in 1949 joined M.Engg. Degree in Soil Mechanics at Harvard University, itself. During this course he was lucky enough to get a chance to work with Professor Karl Terzhaghi. Also in this period he could get a Training with US Corps of Engineers, Tennessee Valley Authority, which is widely known to the engineering word, because of their variety of publications in Civil / Structural Engineering. On sparing these memorable years in USA, Prof Varghese returned back to India, to serve his mother land. After returning to India in Yr 1950, he assistant as a Soil Specialist at Hirakud Dam Project, Orissa. At the end of this rigorous fieldwork for two years, in yr 1952 joined IIT Kharagpur to work with Professor Lyse, Head (CE) to study concrete structures. He was soon deputed on a UNSESCO Fellowship to study concrete with Prof.A. L. Baker, at Imperial College, London, UK. 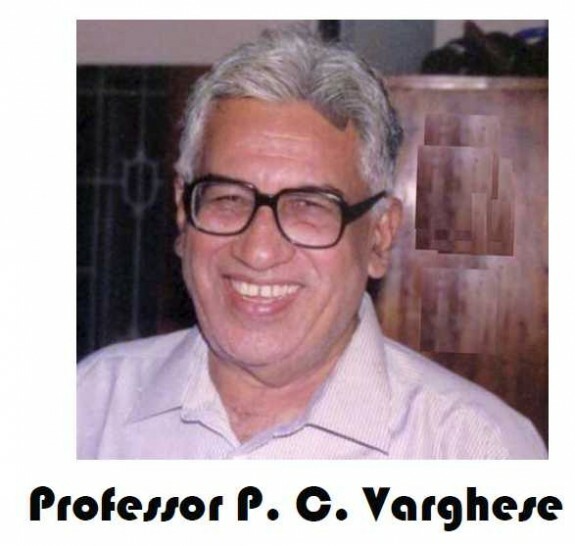 In 1954 Prof. Varghese did his Ph.D. at IIT-Kharagpur itself. After completion of Ph.D. preferred to join institute rather than Industry. He had the privilege of working as one of the founding staff members of IIT Kharagpur from 1950 to 1961. Also worked as a Construction Engineer for campus development works from CPWD, at IIT Kharagpur. In 1961 he joined at IIT-Madras (Chennai) as Head of the Civil Engineering department. Served there with his excellent work from 1961 till 1972. During his stay with IIT-M, he obtained German Government funding and technical support to develop the Structural Engineering Laboratory and Hydraulics Laboratory. He also encouraged and groomed many faculty members and graduates into leadership roles. From Yr. 1972 to 1982 he served the Moratuwa Univeristy, Colombo (Sri Lanka). Also acted as UN advisor to the Ministry of Works, Sri Lanka during this period. He had honour of working (and Leading) a team of International experts. There he worked with the UNCHS and the Ministry of Works and Housing on many building projects. In 1983 he returned back from Sri-Lanka and settled down at Chennai. Currently the Legend is authoring a book on Engineering Geology. He studied Shell Structures at the Imperial College, London and also taught the subject at IIT Kharagpur, IIT Madras. As a result of this wrote a book on this complex subject in a very very simple language, with less mathematics and more concepts and application. The book covered wide panorama from Historic development of shells till modern theories and typical design of folded plates and shells. Dr. P. Mannar Jawahar, vice chancellor, Anna University wrote the forward to his book. In which he has appreciated his efforts, largely. The examples in this book were based on the “Notes for a Short Course on Concrete Shells and Folded plates fro Practicing engineers”, prepared in Yr. 1972, by him and Prof. P. S. Rao at IIT Madras. The books writing by Dr. Varghese on foundations / soil mechanics were also appreciated by Students, professors and practitioners as it contained many practical aspects. Having 60 years of professional experience, all the books written by Dr. Varghese is a blend of theory, practice and simple tools and tips. Dr. P. C. Varghese is one of the Gems of Structural Engineering with strong academic background. On behalf of the Civil / Structural engineering fraternity I thank Dr. Varghese for render such a best services to society and providing us with excellent literature. Let’s pray god for his health, wealth and happiness. - Correspondence with – Dr. N. Subramanian, Dr. C. Ganapathy, Dr. P. Meher, Dr. Koshy Varghese, Dr. CVR. Murthy. I welcome your effort in bringing the life history of Dr. P. C. Varghese. Pl. maintain the same pace for the benefit of novice. It is evenly essential to know the background of distinguished civil engineers along with design/construction practices. The downloadable version (PDF format) of the profile of Dr. P. C. Varghese is as enclosed. Downloadable version of profile of Dr. Varghese. Prof. P.C.Varghese is still going from strength to strength. His latest book is due to be published by Prentice Hall of India ! "MAINTENANCE, REPAIR & REHABILITATION AND MINOR WORKS OF BUILDINGS"
Here is a great teacher, a great engineer and more than that a great human being. If you go to Gunidy Engineering College of Chennai you can see still see the name board of Prof Varghese in one of the rooms. That is the respects he commands. He is 90+ . A couple of years back he visited a building which was just commissioned. He was impressed with the day lighting and requested that he be shown with the lay out , the size of glass etc to understand the design further. I was amazed by his interest even at this age and the child like enthusiasm. He is a great guide to all young engineers and a role model to all teaching and practicing engineering fraternity. very correctly said . . . all 'Gems' / 'Iconic' personalities are ground to earth. . .and have extraordinary level of curiosity . . . but as far as 'Ethics' are concerned they are very very firm and determinate . . . never yield / deviate from ethical path.
. . . understand the design further. I was amazed by his interest even at this age and the child like enthusiasm. With heavy heart I wish to inform all that our beloved Prof. P.C. Varghese passed away at his home in Adyar, Chennai peacefully on 15th July 2018. Our heartfelt condolences to his family and friends. Let his noble soul rest in peace. I have used a no. of Books by Prof. P. C. Verghese for Structural Design as well as Foundation Engineering. Having a sword with both edges (Structures & Geotech.) sharp, his books remain very useful. More over his Practice oriented approach serves as ready reckon-er for many practice problems. His contribution to academic and practice shall remain with us even after his demise. Pray almighty to Rest his soul in peace.